BRIDGEVILLE, Del. – Governor John Carney on Thursday announced an initiative to stock basic needs closets in 45 high-needs Delaware schools. The closets will receive supplies in time for the start of the school year thanks to the coordinated efforts of Delaware educators, Delaware businesses, Delaware healthcare institutions, and a partnership with the nonprofit First Book. Governor Carney showcased the closets at three schools – one in each county – to highlight the impact these free supplies will have on Delaware students and families. Educators at Highlands Elementary School in the Red Clay Consolidated School District, Towne Point Elementary School in the Capital School District, and Phillis Wheatley Elementary School in the Woodbridge School District hosted Thursday’s events. 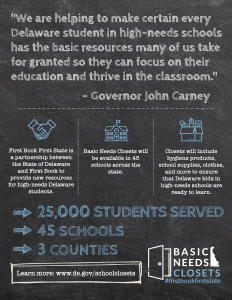 Delaware’s basic needs closets will provide elementary and middle school students across the state with increased access to free products designed to meet students’ needs so they can effectively participate in class. Each school’s basic needs closet will be stocked with products identified by districts and charter schools as essential to the wellbeing of their students, including hygiene products, school supplies, clothes, and more. Students will be able to discreetly access the closets throughout the school year. Delaware healthcare institutions and businesses statewide donated funding for the closets, including Christiana Care, Bayhealth, Nemours, Incyte, Nanticoke, and Beebe Health Systems, as well as Cover Rossiter, EDiS, and Drinker Biddle. Delaware partnered with the nonprofit First Book to purchase the basic needs products at a reduced rate, as a part of the First Book First State partnership. Delawareans can visit www.de.gov/schoolclosets to learn how to help. Follow news about the Basic Needs Closets initiative on social media using the hashtag #firstbookfirststate. The Governor’s focus on meeting students’ basic needs demonstrates the state’s commitment to supporting the needs of Delaware’s students to help them learn and thrive in school, which is part of the Governor’s broader education policy. The Delaware Department of Education will be supporting the Basic Needs Closets initiative. Governor Carney in July announced the creation of the Innovation and Improvement office, which will support educators and students in high-needs schools, especially those in the City of Wilmington. Delaware districts and charter schools have also welcomed the basic needs closets as they look for new ways to meet the diverse needs of their students.